Glow wire products feature cutting edge inverter technology providing the highest level of glow wire lighting output available at the best possible price.Glow wire is a great choice for creating your own rave attire. There are all kinds of colors and lengths available, and they come in a kit, so you don’t need to be an electronics expert to get started. These flexible wires can be attached to costumes or other garments. 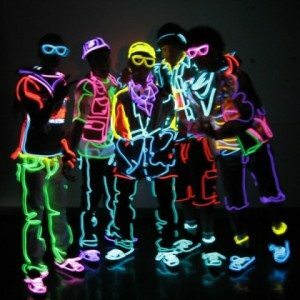 Another way to go is to mix-and-match several pieces of rave attire. Pick from a variety hats, t-shirts, LED belts, backpacks, and more to express your own style from head to toe. Glow Wire is a bright flexible light wire that simulates neon. It’s battery-powered, enabling it to be easily incorporated into costumes or moving props. Our Glow Wire is made from the brightest, longest lasting electroluminescent cable available – it will not crack or “burn out”. Our control boxes emit super high frequency output, providing the brightest effect possible with no sacrifice to wire life. The Glow Wire is 1/8 inch diameter, flexible enough to be loosely knotted, and can be viewed from all sides (entire surface area is lit). It’s cold to the touch and water-resistant, making it suitable for almost any application. It is available in 4′, 7′, and 20′ lengths. Requires two AA alkaline batteries which provide at least 6 hours of light. Includes 10 inches of lead wire between control box and Glow Wire (may be extended with GWE36 36 inches Lead Wire Extension). Also features a flash switch, allowing you to flash the Glow Wire on and off approximately once per second, if desired. Additional Glow Wires (GWR07, see Glow Wire section under Lighting Technics) may be purchased separately to change the color of your Kit. 2X Glow Wire is 3.1mm in diameter or in inches (0.1220472″). All glow wire kits should come ready to use, require no soldering and are equipped with e-z disconnect connectors. 2X glow wire kits come in lengths from 10 to 40 ft. and we can custom make any length or configuration you need. All 2X Kits require 12VDC. Certain colors of Double Glow Wire can be as bright as neon wire. It is the greater thickness that often makes neon wire so much brighter.